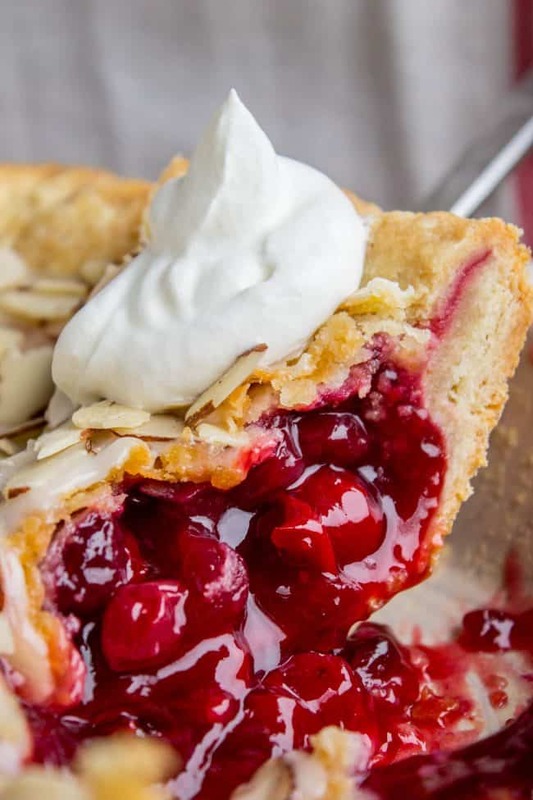 This Cranberry Cherry Pie is just what you need for Thanksgiving! It’s has perfect pops of tart from of the cranberries. The almond glaze on the top adds the perfect crunch! How’s Thanksgiving prep going at your house? We’re in full baking mode over here. I already made my Make Ahead Turkey Gravy. The turkey is thawing in the fridge. 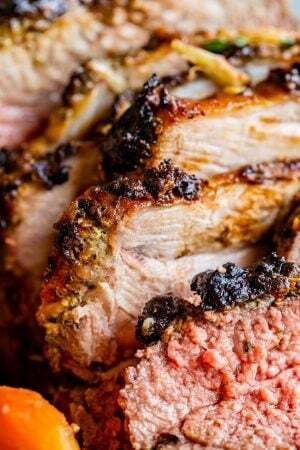 I’m planning to brine it on Wednesday and then make this Sage Butter Roasted Turkey. It’s so good. I cook my turkey in a bag. It always turns out, so why not?? I just posted tons more ideas for What to Make for Thanksgiving, check it out if you need more menu ideas! I’m bummed that I didn’t get today’s recipe out to you guys sooner, because it’s so perfect for Thanksgiving! 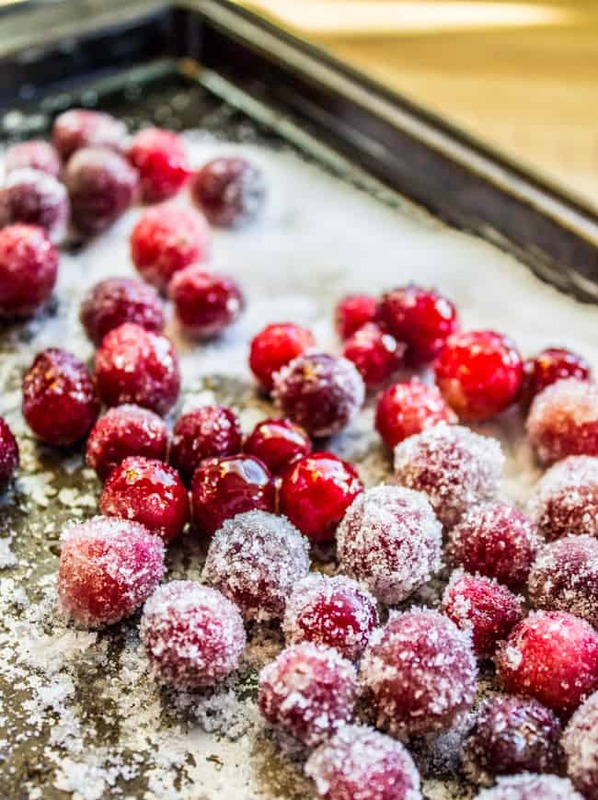 I mean, is there anything more gorgeous than cranberries? And it’s a pie, so doubly perfect. But that’s okay, if you’re already done shopping for Thanksgiving you can save this recipe for Christmas. It’s a great holiday pie. Don’t overwork your pie dough! The almond glaze on today’s recipe is what gets me though. I’ve never seen glaze on top of a pie before, but why not?? I got the idea from a pie recipe in an old Pillsbury baking pamphlet. I changed it up quite a bit, the first order of business being a homemade crust of course. You don’t HAVE to make a homemade crust, but oh my goodness is it good. 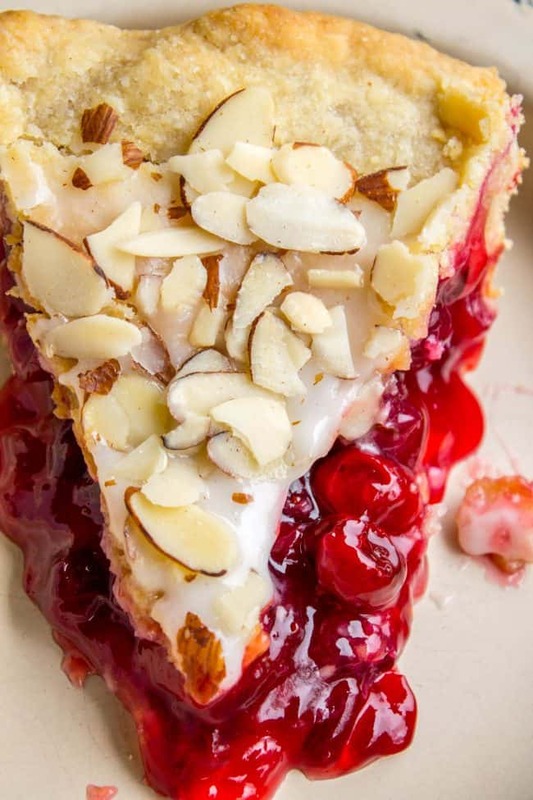 I love how pretty the almonds look on top of the slice of pie. They add the perfect crunch. This would be really fun to serve with Sugared Cranberries! It would be so pretty. Happy Thanksgiving week everyone! Enjoy the time with your family! 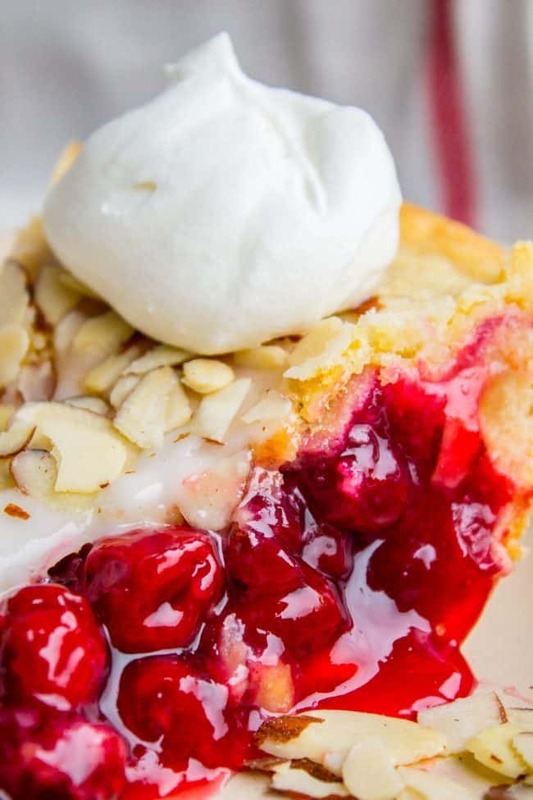 This Cranberry Cherry Pie is just what you need for Thanksgiving! It's has perfect pops of tart from of the cranberries. 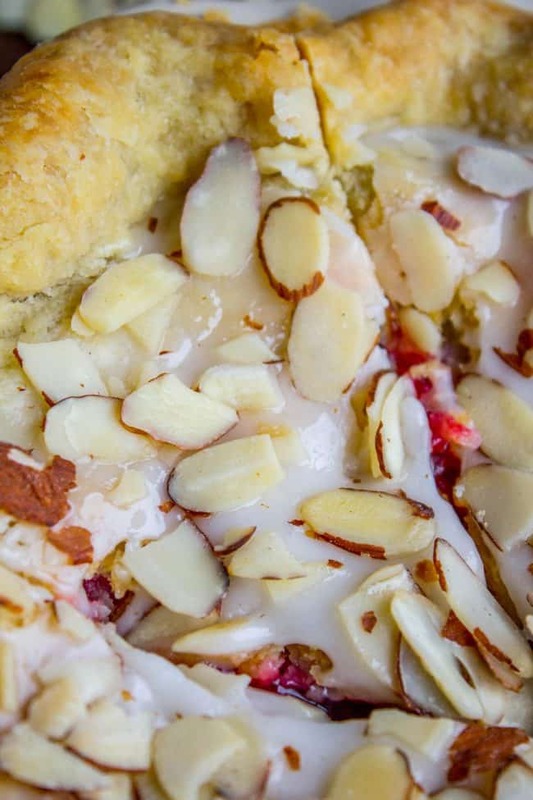 The almond glaze on the top adds the perfect crunch! Add the half beaten egg to the cold water that you put in the freezer. Beat it together, then add it to the butter mixture. Stir until it is just coming together, then use your hands to knead it once or twice (only to make it come together). Divide the dough in half. 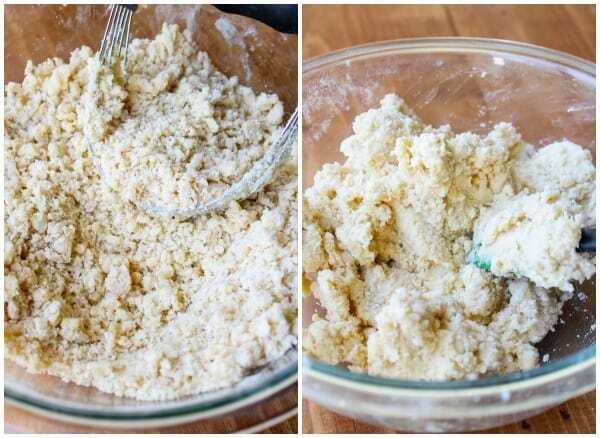 Roll out the dough on a well-floured surface. I love to use my pastry cloth. Roll the dough loosely on the rolling pin to transfer to a 9-inch pie pan. Fold the edges under. 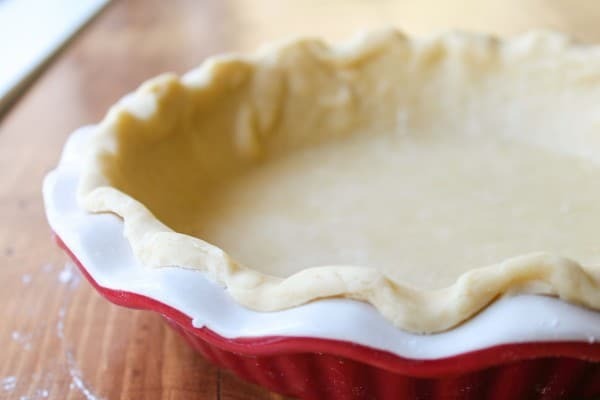 Place the formed crust in the fridge while you make the filling. Make the filling: Rinse the cranberries and pick them over, removing any stems. In a large bowl, stir together the cherry pie filling, cranberries, cornstarch, white sugar, a dash of salt, and vanilla. Pour the filling into the shaped pie crust. 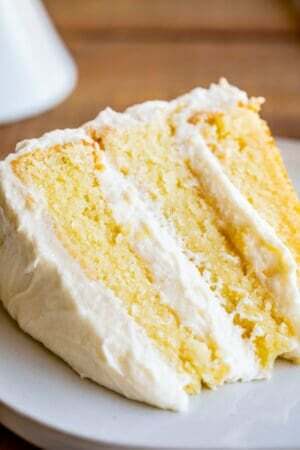 Sprinkle 2 tablespoons of cold butter over the top of the filling. Roll out the other pie crust. Carefully lay it on top of the pie. Fold the edges under and crimp as desired. Use a sharp knife to vent the pie. Bake at 425 for 15 minutes. 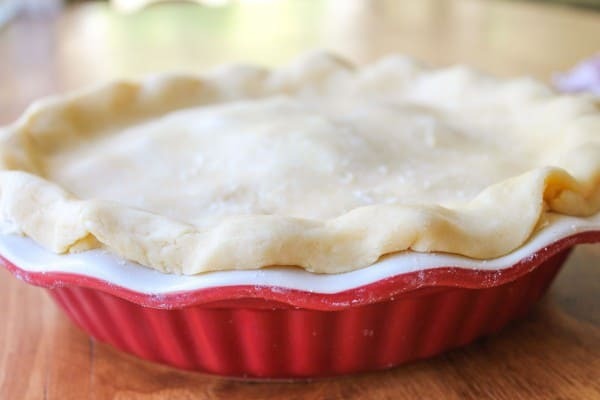 If your pie filling looked very full, bake it on a baking sheet just in case it bubbles over. Remove the pie from the oven and loosely cover the whole thing with tin foil that has been sprayed with nonstick spray. Return to the oven and bake for another 35 minutes. Remove the tin foil and see how the crust looks. The edges of the crust should be golden, and the center should be under baked. Remove the foil, fold it into quarters and cut out the center (so that you have a circle of tin foil with a hole in the middle.) Cover the edges of the crust with the foil to prevent over browning. Let the pie cool on a rack for several hours or overnight. Make sure you cover it after a while so it doesn't dry out. 1-2 hours before serving the pie, make the glaze. 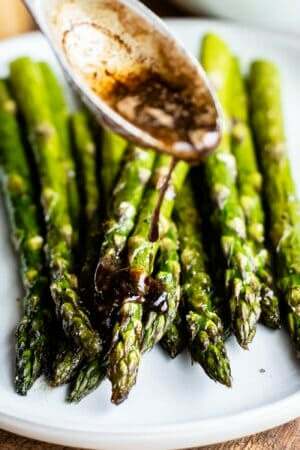 In a small bowl, whisk together the glaze ingredients. Drizzle the glaze over the top of the pie. Use the back of a spoon to make sure it gets in every nook and cranny. 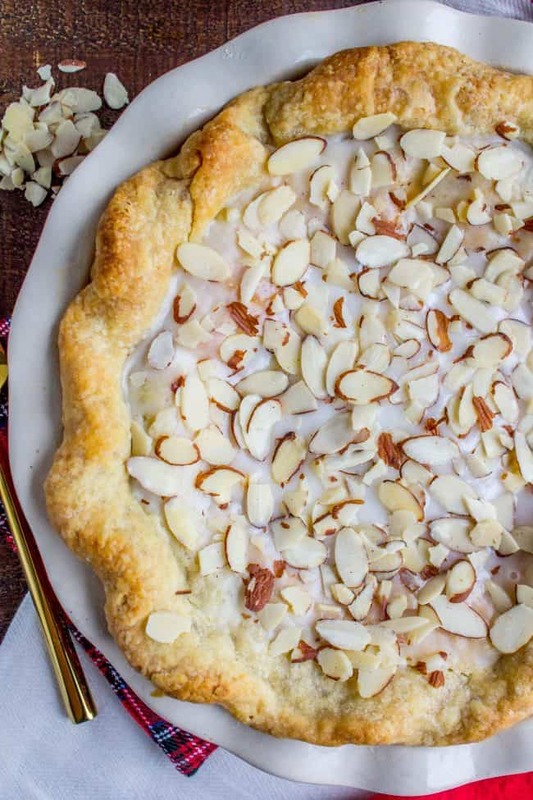 Immediately sprinkle the sliced almonds on top of the glaze. 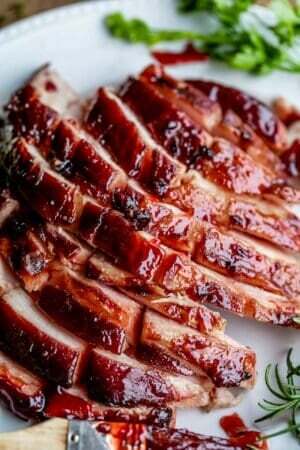 Let sit for an hour or two until the glaze hardens, then slice and serve. *You are not going to overcook the filling on this pie, so the priority here is getting the crust browned. Of course you can use a store bought crust if you don't want to make your own! Here’s my other favorite cranberry pie: Cranberry Custard Pie. Custard makes everything amazing! 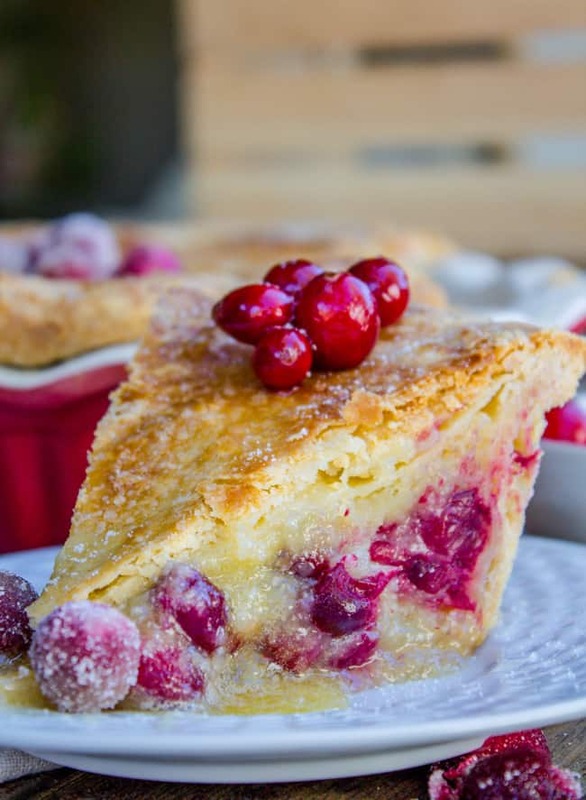 Brown Butter Cranberry Tart << this is a total show stopper. 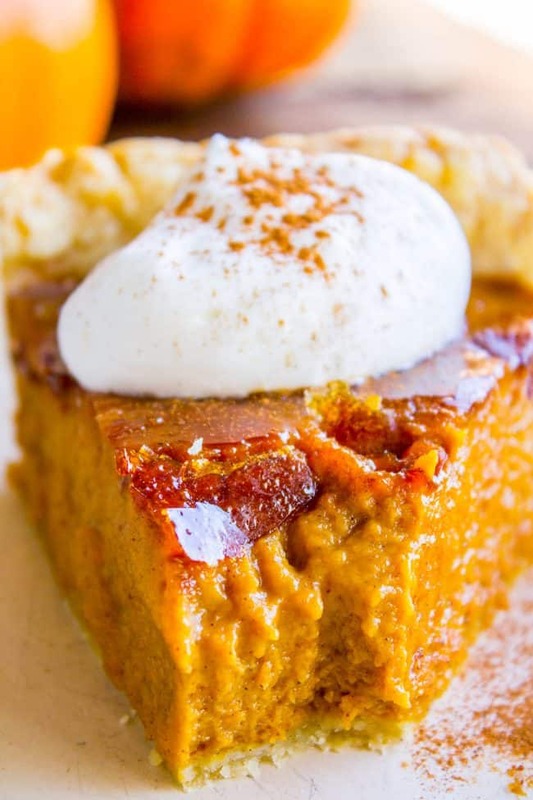 Here’s the other pie I’ve been obsessing about this week: Crème Brulée Pumpkin Pie! That crackle, you guys!! 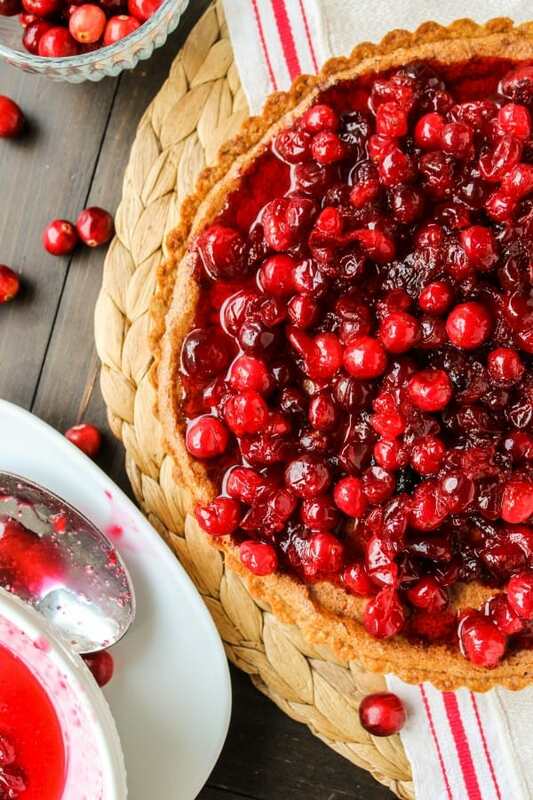 More cranberry pies to love!! « Previous PostWhat You Should Make for Thanksgiving! I prepared this pie for Thanksgiving. So easy and very good. In fact everyone said it was the best pie ever. It will became a regular in my menu. Thank you for sharing such a delicious easy pie recipe. So happy to hear that Nancy! Thank you so much for sharing your review! I love it! This looks so good!! I’m going to be adventurous and make it for Thanksgiving tomorrow. 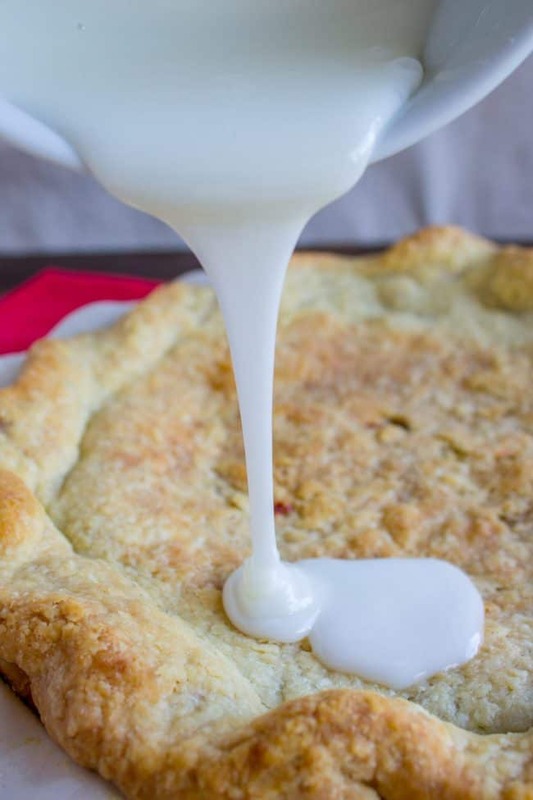 It looks like it is made in a deep dish pie pan—is it? Hey Betsy! Great question! I did use a deep dish, good eye :) BUT I actually don’t think you need to. It’s not an overwhelming amount of filling, and I actually wished that the pie had been a little taller. I’m making another one today and am going to try it in a regular pie pan. I’ll let you know how it goes! I made the pie last night and put it in a regular pie pan. I couldn’t quite get all the filling in the shell-had to leave a little in the bowl. I made three desserts, and this pie was everyone’s favorite! It is Delicious!!!! Thanks for a great recipe! Hmmm. . . .now I have a dilemma . . . do I make the Pumpkin Pie you just recently posted or this pie??? I think I’m going with this pie as it’s a bit different and I know there will be pumpkin pie there already. It looks amazing Karen. I hope mine turns out as beautiful as yours! Have I told you I’ve started making all my pie crusts with LARD and they turn our amazingly flaky and light. I’m never going back. Hey Lil! You roll out the first pie crust and lay it in the pan. Then you add the filling. Then you lay the second pie crust on top and crimp. Does that makes sense? I added a bunch of how-to photos above the recipe, hopefully that will help. Let me know if you have questions! Ooh!! 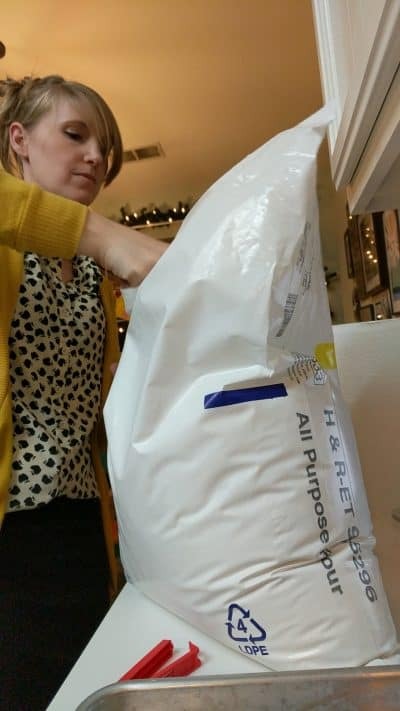 How do you store the flour once you’ve opened that giant bag? Ooh! How do you store the flour once you’ve opened that giant bag? ?